Quavo Marshall (Quavious Keyate Marshall) is an American rapper, songwriter and musician. This biography profiles his childhood, family, music career, achievements and timeline. American rapper, songwriter and musician, Quavious Keyate Marshall, better recognised by his stage name ‘Quavo’ is the co-founder of the popular hip-hop/ rap group ‘Migos’. Along with Kirshnik (Takeoff) and Kiari (Offset), Quavo has released singles that have topped at the US music charts. 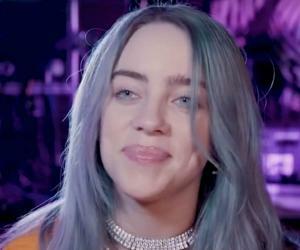 The trio’s debut single ‘Versace’ made it to the U.S. billboard 100 and had music artists such as Drake and Justin Bieber gushing over the song on their social media accounts. Canadian rapper Drake went on to create a remix version of the song with the rap group. Quavo began his career in 2013, and has continued to belt out one hit after another with his latest single ‘Bad and Boujee’ topping the U.S. Billboard chart. As a teenager Quavo had dreams of making it to the helm of the hip hop industry, and since the launch of his career, he has received success in each enterprise. He is currently managed by ‘Coach K’ and has collaborated with producers such as Zaytoven and Murda Beatz. The rapper has often found himself and his group members in controversies either pertaining to illicit possession of drugs or inciting a riot. However, he hasn’t let these charges come in the way of his success. 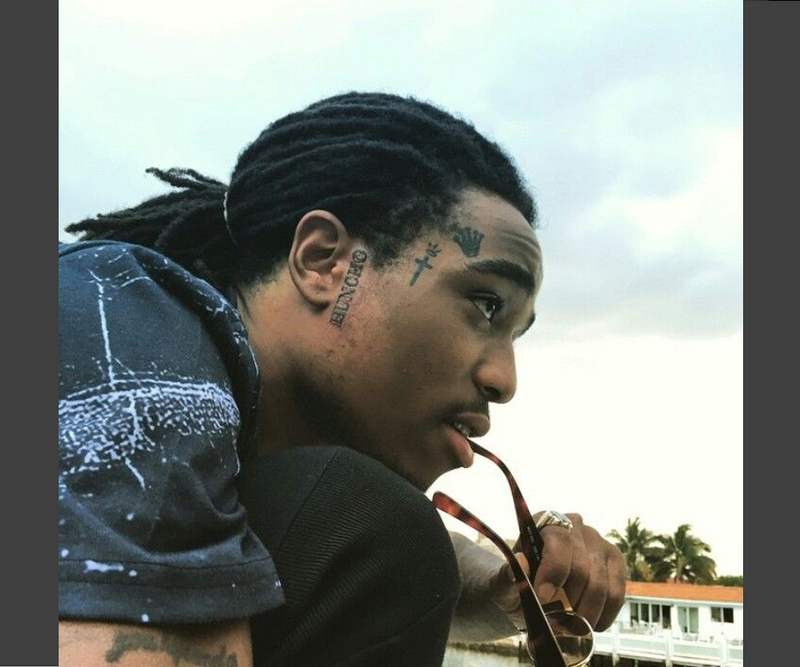 Quavo Marshall was born on 2nd April, 1991 at Atlanta in Georgia. His mother raised him along with his nephew, Krishnik, popularly known as ‘Takeoff’ and his cousin, Kiari, popularly known as ‘Offset’. He attended ‘Berkmar High School Patriots’ in Lilburn, Georgia. 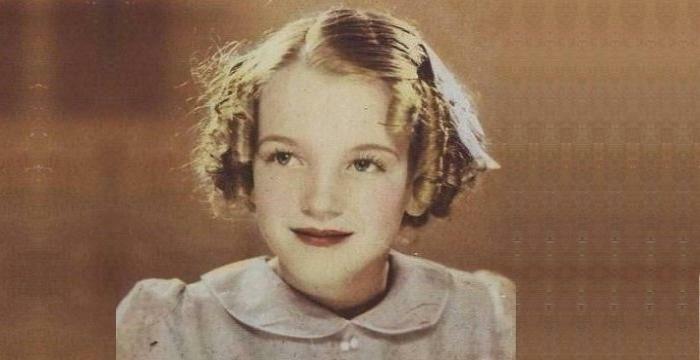 During his school days he would play for his school football team as a quarterback. When he reached seventh grade, he found new interest in hip hop music and along with his cousin and nephew, began composing his own music and songs. To pursue a career in music, he dropped out of senior year in high school, and began recording songs with ‘Takeoff’ and ‘Offset’ locally. The trio used to take their songs to clubs and offer to pay for a DJ’s drink if he played one of their songs at the club. Quavo formed the rap group ‘Migos’ along with ‘Takeoff’ and ‘Offset’ in 2009. In 2011, he released the group’s first ever mixtape called ‘Juug Season’. It was followed by another mixtape the next year titled ‘No Label’. However, his group didn’t acquire much fame until their breakthrough song ‘Versace’ was released in 2013. Without any promotion, the single went viral and occupied a spot on the US Billboard Hot 100 charts. The song became so popular that Drake remixed the song along with the group and added it to his album. Soon after their single became a hit, they released another mixtape titled ‘Y.R.N’ or ‘Young Rich Niggas’. Several magazines like ‘Complex’, ‘SPIN’, ‘Pitchfork’ and ‘Rolling Stone’ credited the Migo’s mixtape for the right amount of rap variations and placed the mixtape in the top 50 list of singles and albums of the year. With fame at his heels, Quavo released another mixtape in 2014 and suggested it to be a sequel to his earlier mixtape ‘No Label’, naming it ‘No Label II’. The tape was downloaded in great numbers immediately after its release. Just a month later, Quavo announced that the group had decided to release an album instead of another mixtape. His group signed a deal with ‘300 Entertainment’ and in June, 2013 they released a single ‘Fight Night’. The song was a major hit and listed on ‘XXL’s 25 Best Songs of the Year’. In July 2015, after a slight delay owing to controversies regarding drug abuse, their debut album finally released. The lead single of the song ‘One Time’ hit radios before the album did, and received good reviews from music critics. The album featured guest collaborations with rap stars such as ‘Chris Brown’ and ‘Young Thug’. At an interview following the success of his first album, he hinted about a second album that his crew had begun working on. 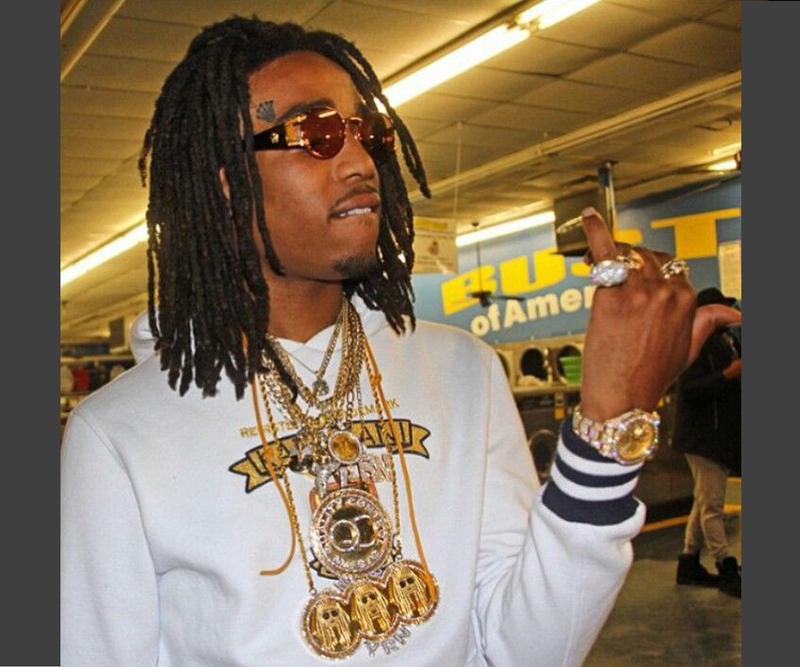 Though Offset was imprisoned on account of the ‘Georgia Southern University incident’, Quavo continued to put his skills to work and released another mixtape called ‘Back to the Bandon’. Quavo made a collaborated mixtape with American rapper Young Thug in 2016 called ‘MigoThuggin’. 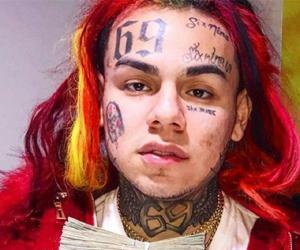 The same year, the lead single ‘Bad and Boujee’ from his second album was played on radios, and the song also featured rapper, Lil Uzi Vert. On 31st October the songs music video was broadcast. Since January 2017, Quavo along with ‘Takeoff’ has been busy on their ‘Dab Tour’, with the tours opening performer as Kippa da Flippa. On the 18th of January, he also released another mixtape ‘Young Rich Niggas 2’. His second album ‘Culture’ was launched on 27th January 2017. The album has 13 tracks and has received positive reviews from music magazines. It has occupied top spots on almost all music charts worldwide. His first single ‘Versace’ was certified gold by RIAA or Recording Industry Association of America. It was also placed in XXL’s top five Hip Hop Songs of 2013. 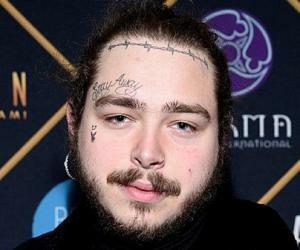 His lead single ‘Bad and Boujee’ from the album ‘Culture’ released in 2016, and became his first ever single to reserve the number one spot on the US Billboard Hot 100. His recently launched second album ‘Culture’ is a chartbusting album. It took up the first spot on both the US Billboard 200 and US Top Hip-Hop albums. It also placed first on the ‘Canadian Albums’ and second on Australian Urban Albums. Along with his band he has been nominated for the ‘BET Hip Hop Awards’ thrice. In 2014, he was nominated for ‘Rookie of the Year’, ‘Best Club Banger’ for the song Fight Night, and ‘Best Mixtape’ for No Label II. In 2015, he was nominated at the ‘BET Awards’ in the category of ‘Best Group’ but unfortunately the trio lost to the duo Rae Sremmurd. Quavo was imprisoned on account of possession of marijuana and firearms within the safety of an educational institute at Georgia Southern University in 2015. But he pleaded not guilty and received twelve months of sentence, which was later suspended after paying a fine. 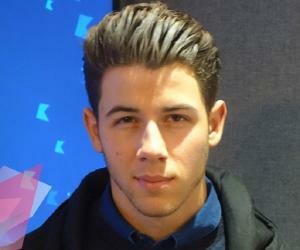 He has claimed to continue working with his nephew and cousin, and doesn’t look to start a solo music career. His ‘Twitter’ page was filled with protests against the arrest of his group member ‘Offset’. On a personal note, Quavo prefers keeping his wealth stacked in the safety of his home. He carries a leather backpack with hefty cash, two phones and an extra T-shirt with him at all times.